Make a network extension cord out of two CAT6a network patch cables with a certified 8P8C (RJ-45) coupler. Each jack accepts one 8P8C plug, allowing you to plug high-speed networking cables into both sides. 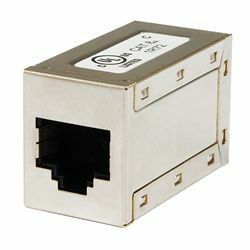 With a double-shielded housing and gold-plated contacts, this coupler is designed for 100BASE-TX (100Mbps) Ethernet networks.